This sentence fragment is what best describes me; an affair of food and book, books and food. Either way, I love both. I think that covers what this blog will be about! But since I normally can’t focus on one thing, this blog will be my personal writing (both food and travel), recipes tested and developed, pictures, cookbook reviews, places visited, and quite possibly anything else I want to share with you, my dear friends. I’m sitting on my boyfriend’s couch on Martha’s Vineyard, after a week of Vegas adventures. With Super Bowl ideas floating around my head and M. at the grocery store doing some last minute shopping, I still haven’t gotten much into the kitchen. 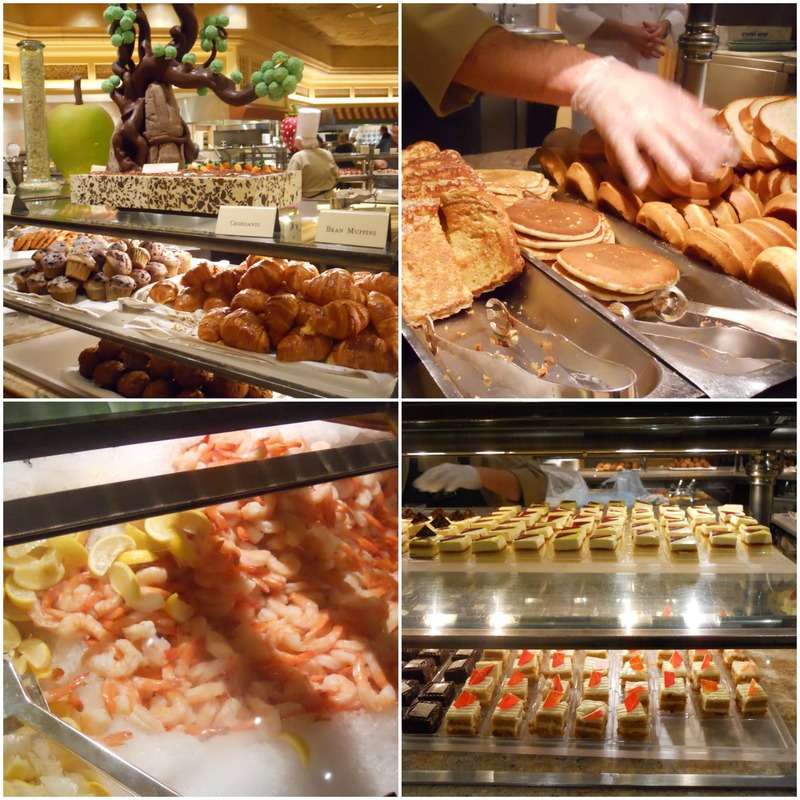 Bellagio Brunch: Sunday Brunch at the Bellagio Hotel is known for being the Best Brunch in America and rightfully so. For either $25 all you can eat or $29 for all you can eat and champagne, you are getting a great deal. The Bellagio is probably one of the most luxurious hotels on the strip, and the food is excellent. Just be warned, the line is LONG, maybe about 15 minutes long. Seems like so much more because of all the people, but they are very efficient in getting everyone in on time. So, I just realized I didn’t take many pictures of the savory items but they were the best part! Pork Belly, Roasted Leg of Lamb, Prime Ribs; Asian Station: Sushi Rolls, Salads, Spring Rolls, Sauces; Soups: Pasta Fagioli, Black Bean, Chicken Noddle; Salad Station; Rices, Pastas, and so many more garnishes. Plus, did I mention endless Champagne!? Next up is Mesa Grill by Bobby Flay. 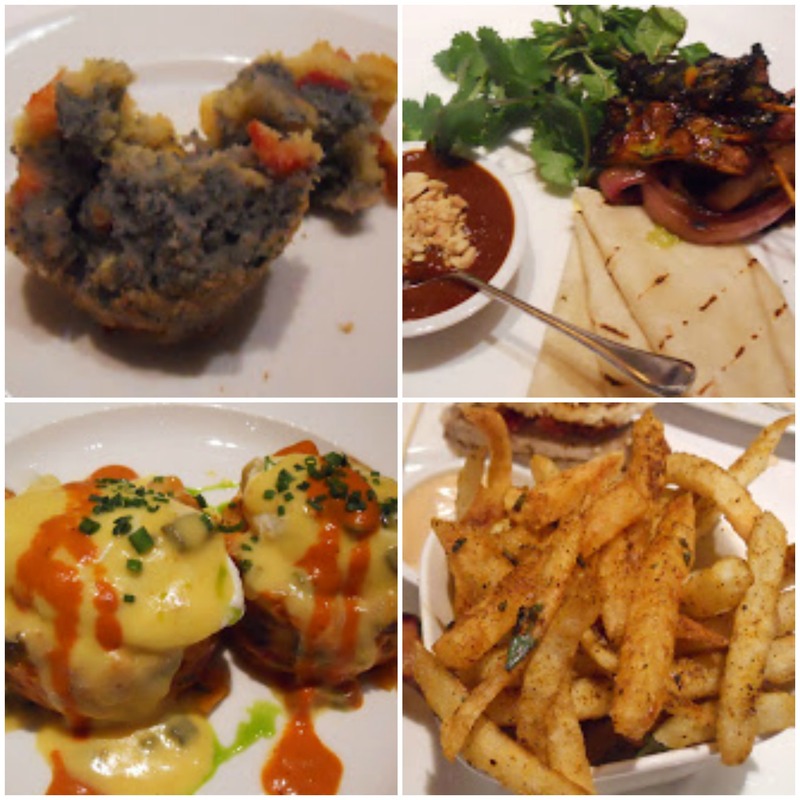 Located in the Caesar’s Palace Hotel, Mesa Grill was a great option for lunch. My brother and his girlfriend were also on vacation in Vegas, so we invited them to lunch with us. Mesa Grill borders on casual dining, showcasing great Southwestern flavors married with Mexican spices and techniques. Service was great, specially after a mistake was made on our order and it was attended to quickly. In the order received: blue corn muffins, Yucatan Mexican tacos, spicy chicken and sweet potato hash Benedicts, and grilled swordfish club sandwich. Fabulous lunch at Fleur by Hubert Keller at The Mandalay Bay Hotel. We decided to start at the top of the Strip and work our way down, so while walking through Mandalay Bay we ran into Fleur. Chef Keller has always been someone I’ve watched and admired and being able to eat at one of his restaurants was a dream come true. We sat down at the bar and chatted with Becky, our bartender, asking for recommendations on drinks and food. Her cocktails were spectacular and included a long list of Absinthe (various preparations), amazing cocktails she had created and the option of making any of your drinks frozen with Liquid Nitrogen. Being it was noon, Absinthe was out of the question (I prefer drinking my 160 proof alcohol after 5pm! ); the Liquid Nitrogen called out attention but she pointed out that since it was cold out also, whatever we froze would become a sort of gelato drink, having to eat it with a spoon. Don’t get me wrong, I love me some gelato but not what I wanted at the time. I decided on a Peach Nectar and Champagne cocktail, which was pretty delicious and after having only one, I was quite buzzed. M. ordered a Stella. The menu is a compilation of small plates, tastes, and samplings of flavors, which make this a great place to grab a bite to eat that will rock your world! 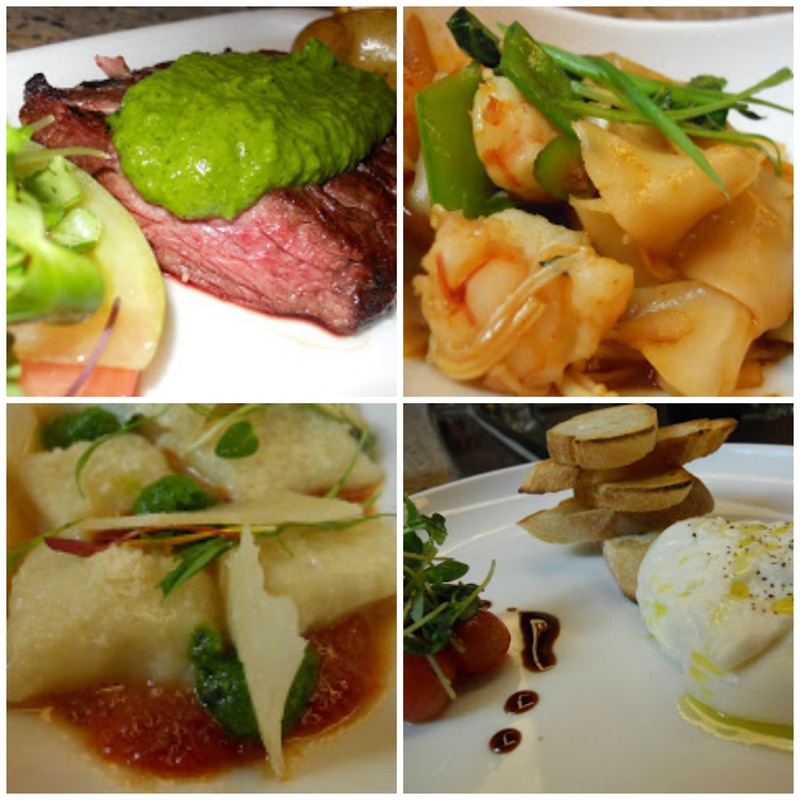 This was hands-down the best meal in Vegas: Burrata, Olive Oil, Sea Salt (Flown in from Italy every 3 days), gnocchi san marzano fondue, pesto, skirt steak* chimmichurri, roasted fingerling, crème fraiche, and rock shrimp rice noodle, snow peas, red dragon sauce. This is half of the food review of Vegas, more to come tomorrow. Thanks for stopping by! A wonderful post and beautiful photos. Thank you for the visit to Vegas. Nice work on the commentary.